Why is rye flour so tricky to get your hands on in the UK? I’ve been craving rye bread ever since we were in Finland, and ended up sending away to Shipton Mill in Gloucestershire, where you’ll find some extraordinary speciality flours. How about mucking around with some Swiss dark flour, organic chestnut flour or something called Emmer wholemeal – an ancestor of modern wheat? There are eight white flours alone, including a specialist cake flour, a French white flour especially for baguettes and an Italian variety for ciabatta. Shipton Mill is fantastic for baking nerds. Melt the butter and heat the beer and water together until they are lukewarm. They should be around body temperature – test the liquid on the inside of your wrist. Stir two tablespoons of the butter, the sugar and the salt into the beer and water mixture until the sugar and salt are dissolved. Sift the rye flour and instant yeast into a large bowl, and add the lukewarm liquid to the bowl, beating with a wooden spoon until the mixture is smooth. Add the strong white bread flour to the bowl a handful at a time, stirring all the time, until you have a soft dough. (You may find you do not need as much as 400g of flour to achieve a soft dough; you will probably need somewhere between 350g and 400g.) Make the dough into a ball and leave in the bowl, covered with a damp tea towel, for 15 minutes. This will help the gluten develop. When the dough has rested for 15 minutes, knead it for five minutes. (This is less kneading than you would require with an all-wheat bread.) The dough should be soft and no longer sticky. Coat the inside of another large bowl with another tablespoon of butter and put the ball of kneaded dough into it, covering the dough ball with a tablespoon of softened butter too. Cover the bowl with the damp tea towel and leave in a warm (not hot) place for two hours to allow the dough to rise. After two hours, punch the dough down and knead it gently for one minute. Divide the dough into two and form it into two round, flat loaves on baking sheets covered with greaseproof paper. Allow the bread to rise in a warm place again, this time uncovered, for forty minutes, while you heat the oven to 190° C (375° F). When the loaves have risen, drag a serrated knife across the tops to make a pattern. Bake the loaves for around 45 minutes (start checking them from about 35 minutes in) until they are golden on top and sound hollow when you knock on the bottom. Glaze the loaves with the rest of the butter, melted. This bread is delicious served while it is still warm, but will keep for a few days in the bread crock. A friendly publisher mailed me just before I left for New York, asking if I’d review a couple of books here for them. 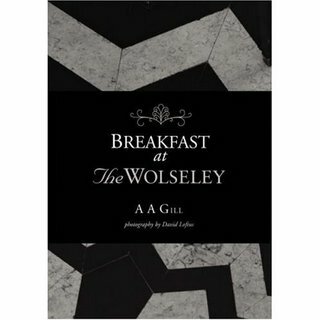 Always up for a freebie (I am nothing if not venal, especially where books are involved), I said yes – and was very, very pleased when Breakfast at the Wolseley turned out to say A.A.Gill on the cover. If you’re not a consumer of English newspapers, you may not have come across him; he’s an author and journalist with a liking for smoking jackets and waspish prose. These days, Gill is the restaurant critic for the Sunday Times, and his is usually the first page I turn to when reading the papers in bed. His writing is unapologetically baroque and often vicious – his description of the Welsh as “loquacious, dissemblers, immoral liars, stunted, bigoted, dark, ugly, pugnacious little trolls” in the Times about ten years ago (he also said that “You can easily travel from Cardiff to Anglesey without ever stimulating a taste bud,”) nearly caused a Celtic uprising and sparked so many complaints from outraged Welshmen (no idea why – I’m married to one of the pugnacious little trolls, and it seemed fair enough to me) that the Press Complaints Commission and Commission for Racial Equality had to weigh in. We Brits love a Commission. The Wolseley is a café-restaurant next to the Ritz in London, set in a building which was originally a gorgeously opulent showroom for Wolseley automobiles in the 1920s. That aesthetic runs through the restaurant itself as well as the book: the hard cover reproduces the design of the marble floors (themselves copied from Brunelleschi’s floors in Santo Spirito in Florence, according to Gill), while a tiny black dust-slip does double duty by carrying the title and author while acting as a slim belt to dress up the cover. I do not usually witter on like this about the outside of a book, but this one is very pretty, and the copious and beautiful photography inside keeps the loveliness factor high. They top it all off with a black satin ribbon bookmark. If this book was a person, it’d be wearing a velvet opera cape. The book opens with an essay on the Wolseley’s history, then one on breakfast; Gill then walks us through a night’s preparation in the restaurant kitchens for the breakfast rush, but somehow takes us there via the Turkish siege of Vienna (croissants, pastries, espresso), Capuchin monks in Venice (cappuccino) and the beekeepers of South London (who supply the Wolseley with honey and beeswax for their cannelés de Bordeaux). My only complaint here is that because he’s writing about something he really enjoys, Gill is having trouble being as poisonous as usual, and I love him for his poison. Every now and then, though, the sliver-tipped dagger slips through the silky prose, so the restaurant’s customer database becomes “a benign Stazi report”; we are ticked off for moving from the “sugar-crusted, multicoloured, zoomorphically shaped processed carbs of childhood for the sombre, brown, bran-rich, blandly goodly flakes of colonic probity and adulthood”. More short essays open each of the food chapters – Vienoisserie; Eggs; English Breakfast; Fruit and Cereals; and Tea, Coffee and Hot Chocolate. Rather wonderfully, you are offered bulleted instructions on how, for example, to prepare the perfectly poached or scrambled egg; a perfect cup of coffee (a discussion of the coarseness of your grind and whether you should select an Arabica or a Robusta); tea types and terminology. The night churns on – Polish plongeurs (“slim-featured, pale-eyed, all of them with the same contrary mixture of relief and resentment: a battened-in, taciturn, steely ambition”) flop about with rubber gloves and misery. I said above that Gill’s prose is baroque and it can be an acquired taste, but it’s a taste well worth acquiring if only so that you can read what he has to say about yoghurt. The essays are punctuated with a good solid armful of breakfast recipes (not by Gill). These are the dishes we all secretly love and avoid eating regularly for the sake of our arteries and pancreas – eggs Benedict, pain au chocolat, omelette Arnold Bennett, lamb’s kidneys with Madeira, crèpes, haggis and duck egg. My heart throbs with the writing, my salivary glands do that squirty thing with the recipes. No recipe for the darned cannelés de Bordeaux, which saddens me, because I love the things. I am torn between keeping this book in the kitchen so I can practise poaching eggs (a trick I have never quite got the hang of) or on the bedside table so I can read about the English breakfast’s “cacophony of meat” before bedtime. I suspect I’m just going to be running up and down the stairs a lot. Just as well, given all the black pudding. So in the end, I didn’t update at all during my visit to New York – apologies if you were checking, but I hope you’ll understand. This was my first trip to the city, and I found myself doing things a long way from my hotel room from the moment I closed the door every morning until I collapsed, exhausted, into the Kitano hotel’s cloudlike embrace every night. Simply put, there is an awful lot of very entertaining stuff to do in New York, from the museums, the architecture, the shopping, the jazz – and the very, very good food – and I found myself much too busy enjoying myself to blog. RUB BBQ (an acronym, this; spelled out, RUB means Righteous Urban Barbecue) is…well, righteous, and urban, and a barbecue joint. (208 W. 23rd St., New York, NY 10011, nr. Seventh Ave.) I do like restaurants which tell you what they do on the tin. This place is about Kansas City-style barbecue: fat, woodsmoke and the charred crispy bits best eaten when you are young and not prone to heart attacks. It’s no-nonsense food, served up in no-nonsense style on waxed paper dishes with pickle chips and hunks of sweetly pappy Wonder Bread – a strangely good accompaniment for smoky, salty, spicy barbecue. Leave any dietary concerns at the door, because the best stuff on offer here is unshamedly fatsome and entirely lacking in vegetably vitamins. The meat is freshly smoked daily in set quantities, and this sometimes leads to certain items running out surprisingly early in the day (on our first visit they’d already run out of burnt ends by 6pm). I’m not sure whether this is a dastardly ploy to get you back in the door in the hope of finding what you were after – if it is, it certainly worked on me. There is an appetiser on the menu called BBQ Bacon Chunks. I like bacon, I like barbecue, and I am partial to the sort of food that comes in chunks, so this was a no-brainer. A waxed paper dish of triple-smoked, thumb-sized rectangles of obscenely fat belly pork turned up, cooked to a melting crisp. “Good God, these things must be bad for you,” said Dr W, popping them in his mouth one by one in a sort of porky trance. “Mmmurgle,” I agreed. Burnt ends are the blackened, fatty end of a beef brisket, cooked until the fat metamorphoses into a charred and friable, tender magic. Portions here are large, and I am still not quite sure how I managed to absorb a whole plate of the things into my person, but the burnt ends were one of those things it’s simply impossible to stop eating. Szechuan smoked duck was good, but not as good as the pork and beef on offer. Its mahogany, lacquered skin was simply gorgeous, all the fat underneath rendered out, but the meat was uninteresting, and not as moist as it could have been. Table sauces include two barbecue sauces, one mild and one spicy, ketchup and vinegar. The pulled pork (see my recipe for pulled pork here) needed a good dollop of barbecue sauce to liven it up, but once it had been anointed was tender and tasty, with some lovely BCBs (Burnt Crispy Bits). Brisket from further up the joint than the burnt ends was leaner, and Dr W’s favourite cut on offer. He tiled the tender slices on a piece of Wonder Bread, added some of that spicy barbecue sauce and ate the whole thing as a sort of heart-attack sandwich. What’s going on here? Wonder Bread in its natural state is a soft, sugary abomination, but is weirdly delicious presented like this. Perhaps there is something in the rub. Because if there is something in the rub, the rub itself is in everything. On every meat, and it also found its way into all the accompaniments we tried – onion strings were battered and fried, then sprinkled with the sweetly spicy rub. It flavoured the coleslaw (making it too sweet for my tastes – but you may wish to ignore what I have to say here, given that pieces of bacon fat the size of my thumb are to my tastes), was scattered all over the fries, and spiked the beans. Those beans beat me – they just tasted too much to enable us to eat more than about a spoonful each, and that rub really made them sweeter than I could manage. Staggering out of RUB after our second visit, five times fatter than I was when I went in the first time, I found I had a greed-induced stitch in my side, and so stopped in a café to recover. Gazing out of the window, I locked eyes with Rupert Everett, craggily walking a dog. Glorious barbecue and surprise movie stars. I really like this city. I’m going to the US for ten days tomorrow for a friend’s wedding in MA and my first trip to New York. (Yes, I am almost pathologically excited about the restaurants.) Posts may be a bit thin on the ground while I’m away, but I’ll try to update occasionally. Today’s recipe is a nice easy marinade for some pork shoulder steaks (a lean cut that benefits from some robust marinading), and an onion and apple pilaf to accompany them. What is it about apples and pork that works so well together? I’ve used Braeburn apples here – although they’re an eating apple rather than a cooking one, they hold their shape well when cooked, especially if you leave the skin on, and that skin is a pretty pink, so they look good too. Being an eating apple, they’re also nice and sweet, which is fantastic with the salty pork. This is an economical dish to cook for a lunch party. You can often find pork steaks on sale at a low price, and although rice is more expensive these days, it’s still not crippling. Serve alongside a nice lemony salad to cut through the sweetness. Marinade the pork in the mustard, honey, lemon, soy and olive oil overnight. Cook under a hot grill, about 7 minutes per side, basting frequently with the marinade. Slice the onions thinly. Core two of the apples and chop them into dice. Chop the garlic. Sauté the onions, garlic and apple pieces with the chillies and cinnamon stick in the olive oil and butter until soft. Stir in the balsamic vinegar and sugar with a teaspoon of salt, and allow the vinegar to bubble and reduce for thirty seconds. Tip the dry rice and the sage into the pan and stir well to make everything is mixed. Pour over the hot stock and bring to a fast boil, then immediately turn the heat down low, put the lid on and simmer gently for 12 minutes. Season to taste and dress with the remaining apple (diced or sliced – it’s up to you) and some fresh parsley. Ah, the cauliflowers of our youth. I’m sure you remember the buggers: grey and brain-ish, boiled until soft and claggy by the school dinnerladies; or (worse) bobbing up and down in salty water in your Grandma’s kitchen sink as a legion of little black insects died in unison and floated out of the florets. They never all vacated the cauliflower – I spent miserable hours at the table with the tip of a knife, digging out wiggly, squashy bodies and things with far too many legs, and smearing them on my napkin. It took me some years to mentally rehabilitate the cauliflower, and I know plenty of adults who still won’t touch the things. Happily, these days you are very, very unlikely to come across an insect-riddled specimen (pesticides are the modern cook’s friend), and grey mush is easily avoided if you’re cooking them at home. Best of all, it turns out that a cauliflower which is roasted or sautéed is totally delicious. It has a great texture and takes on a sweet and toasty flavour a little like roast chestnuts – nothing at all like the bitter, wet stuff you remember from school. 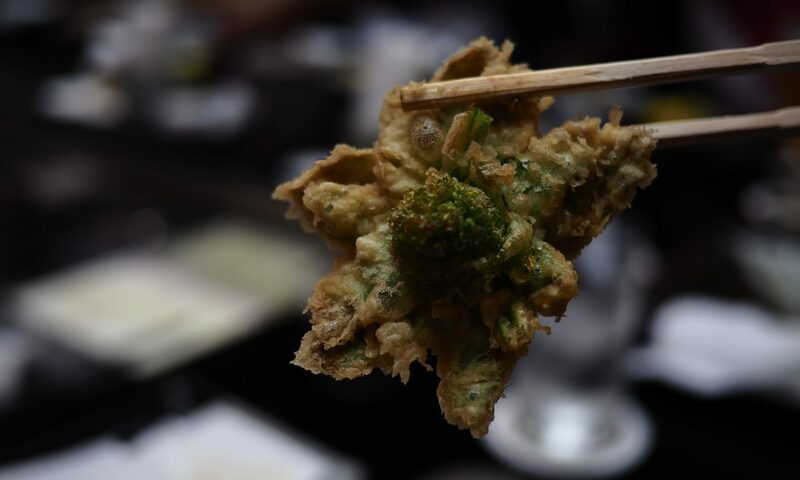 Serve as a side dish or as one of a selection of vegetably nibbles. And if you’re low-carbing, which at least two of my friends are at the moment, this is a very tasty way to get your vitamins without carbs. Separate the cauliflower into large florets (see picture) and slice them lengthways so you have flat pieces of cauliflower about a centimetre thick. Heat the oil in the pan until it is shimmering, and slide the cauliflower in. Brown on one side (four or five minutes) before turning carefully and browning on the other side. Serve spread out on a large plate, sprinkled generously with sea salt. A quick reminder – it’s that time of year again, so if you’re in a foraging mood, spend some time this weekend harvesting some elderflower heads for cordial and fritters. You may also enjoy this article from the Times on wild foods, especially if your garden is as full of nettles as mine is, but please do not follow Prue Leith’s example and raid the nests of wild geese for eggs unless you want a serious telling off from the RSPB! If you really can’t live without a June goose egg and you’re near Cambridge, head to the fruit and veg stall outside the Grafton Centre, where they often have a large tray of goose eggs to buy. I love currants. The little dried rabbit-dropping things, I mean, not the tart currants that we grow in England, which are all very well in Cumberland sauce and so on, but lack the sweet seductiveness that you really need for an excellent cake. The currants I am talking about are Zante currants, which are tiny, tiny dried grapes grown absurdly sweet in the Greek sunshine. They’re the fruit you’ll find in Eccles cakes, and they have a wonderfully sweet and mildly tangy flavour, quite different from other dried vine fruits. Horrifyingly, especially if you share my tidy British habit of compartmentalising foods, I discovered when living in France that on mainland Europe nobody differentiates between currants, sultanas and raisins. If it’s small, dark and wrinkly, it’s called a raisin, so if you are in France and want some currants, you’re going to have to do a bit of light mime in the grocer if you want to buy proper, tiny Zante currants rather than horrible giant American golden raisins, which are processed with sulphur and taste rubbish. The golden raisin sometimes masquerades as a sultana in the UK too – beware. Preheat the oven to 200° C (400° F). Lay 18 little paper cake cases in bun tins, and beat all the cake ingredients together in a mixing bowl with an electric whisk for two to three minutes, until the cake mixture is pale, smooth and fluffy. Divide the mixture between the cases (they should each be about half-full). Bake in the hot oven for between 15 and 20 minutes. Devotees of this blog should be familiar with the Dr Weasel Aural Method of cake testing – when your little cakes come out of the oven, bring an ear close to them and listen carefully. If the cake is making tiny prickling noises, it is not ready: return it to the oven for a couple of minutes. A finished cake is silent. As Emily points out in the comments, a finished cake may not be *entirely* silent. Minimal prickling noises are allowed – do not allow your cakes to carbonise. Put the cakes in their paper cases on a wire rack to cool. While they are cooling, make the buttercream icing by using your electric whisk to beat the butter, water and icing sugar together until it too is pale, smooth and fluffy. Spread the icing on the cakes when they are cold, and decorate any way you like. This is a kind of rösti, which I came up with to accompany some jerked chicken. Plantains are great: they are a cousin of the banana, and look like a giant, green, yellow or creamy version of the things you eat for pudding. Unlike a banana, a plantain is usually served cooked, either when under-ripe, when they are wonderfully starchy, or overripe, when they become sweet. You can treat an under-ripe (green) plantain much as you would a potato. I’ve teamed my plantains up with a sweet potato here for some colour and extra sweetness. The allspice here is typically Jamaican, and goes really well with the jerked chicken you’ll find on this site. Peel the plantains by chopping them in half widthways (not lengthways, as you would a banana) and easing the tough skin off. Grate the creamy flesh of the fruit. Peel and grate the sweet potato and the onion. Mix the grated sweet potato, plantain, the onion and allspice and some salt and pepper to taste in a large bowl, and melt a generous amount of oil and butter together in a large, non-stick frying pan until the butter starts to bubble. Add the plantain and sweet potato mixture to the pan and pack it down so you have a thick pancake. Fry over a medium heat for ten minutes, then put a large plate over the pan and turn the whole arrangement upside-down, so the pancake ends up crispy side up on the plate. Return the pan to the heat, add more oil and butter and slide the pancake in, uncooked side downwards, and fry for another ten minutes. Serve piping hot.